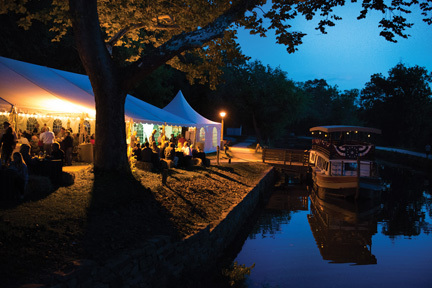 The C&O Canal Trust will be hosting the Fifth Annual Park After Dark Fundraiser on Saturday, September 19, 2015 at 6:00 p.m. to benefit the C&O Canal National Historical Park (NHP). This unique event is held beneath the stars in the C&O Canal NHP at the Historic Great Falls Tavern and features live music, great food, libations, a live and silent auction, a camp fire, and more. The C&O Canal Trust is the official non-profit partner of the C&O Canal NHP, and last year raised $148,590 at this event. Funds from the event will help to sustain the historical, natural, and cultural heritage and recreational opportunities within the C&O Canal NHP. The proceeds from the special live auction will support the Canal Classrooms education program, which offers curriculum-based education to over 8,000 students each year, exposing them to the arts, science, technology, math, and engineering concepts. Park After Dark is the largest fundraising event held annually to benefit this national park. This year’s event will be emceed by “Tenacious” Topper Shutt, Chief Meteorologist for WUSA9, and will feature lively music by the River Run Band, a visit from the Canal mules, delicious barbeque dinner, hearty accompaniments and desserts, and a roaring camp fire with s’mores to round out the evening. During the event, the William O. Douglas Stewardship Award will be presented to Roy Sewall, the Founding Chairman of the C&O Canal Trust Board of Directors, in recognition of his ongoing support of the C&O Canal Trust. The evening will also feature the first-time presentation of the new Canal Pride Volunteer Service Award to Robert Mertz, a former Board member of the C&O Canal Trust. A variety of auction items will also be available for bid, including an F-35 Lightning aircraft simulator experience; several skydiving opportunities; test track driving experiences; golf packages; tourist packages to St. Michael’s, Charlottesville, Boonsboro, and Shepherdstown; beautiful framed photography and artwork; and gift certificates for restaurants, wine tastings, theaters, shops, and more. The sponsors for the event include The J. Willard and Alice S. Marriott Foundation, Minkoff Development Corporation, and Quality Products and Systems, LLC. Tickets for the event are on sale now for $175 per person. $125 of that price is a tax-deductible donation to the C&O Canal Trust. Tickets are available at www.ParkAfterDark.org. This is a rain or shine event, and attire is Canal Casual. About the C&O Canal National Historical Park: The C&O Canal National Historical Park preserves and interprets the historical, natural, and recreational resources of the C&O Canal. Over 5 million visitors a year enjoy the opportunities for recreation and understanding that the park has to offer. For more information, visit the park’s web site at www.nps.gov/choh.